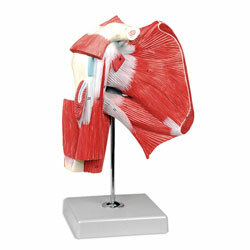 This model illustrates, in great detail, the muscle, ligament, and bones of the shoulder. Through different muscle sections, it is possible to observe the profound musculature to the bone. One-piece, life-size model. 9" x 7-1/2" x 4-1/4". 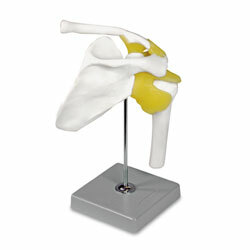 This life-size model shows the shoulder joint with ligaments. Mounted on base with stand. 11-1/2" x 5" x 5".